I never envisaged that at 41 years of age, I would morph into my Mother and Victor Meldrew, but I really hate litter. Fag ends, take away coffee cups and pop cans make me furious when I see them clogging up my neighbourhood. However, there is something more serious than just littering in my view, rubbish really can be a serious problem in my neighbourhood. I live in a flood area – I don’t live near a river nor the crashing waves of the open sea. I live by a drain that is old and inefficient. Its prone to flooding and makes a really scary sight once its heading towards my front door after a particularly heavy down pour of Penylan rain. It gets blocked mostly because of rubbish. I also have children who like to play out – football is a firm favourite. We have a lane behind the house that would be perfect for football. No one drives down it (apart from people looking to help themselves to scrap metal) and its in ear shot and sight of my house. But it remains stubbornly difficult to get my kids to play there, `Its too dirty Mummy`. 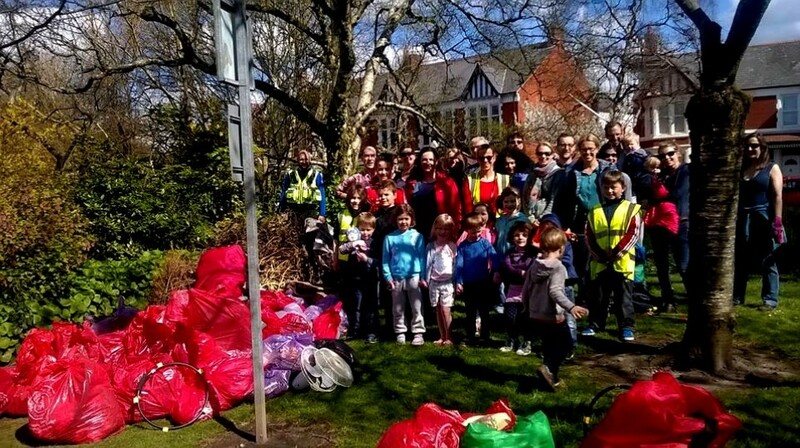 So I organised the Keep Penylan Tidy event and wanted to tell you all how easy it was. On the day we had over 45 members of the community, from Ben aged 2 years old to Mary aged 80+ out in their street, lane and parks tidying up rubbish. These people all shared my vision, keeping our community clean and tidy. Keep Wales Tidy helped us with the loan of the equipment – litter pickers, gloves, bags and hoops for keeping bags open. They helped explain what their role is on a daily basis and offered to help with further tidy ups. They gave us free reign to tidy where we wanted so people could focus on their own street if they wanted. Most importantly they facilitated taking away all the rubbish. Fabulous! I posted information on social media and contacted community councillors, police and the school to ask people to get involved. Finally we all finished with coffee and cake in our fabulously clean lane – our beautiful Penylan, tidy again.